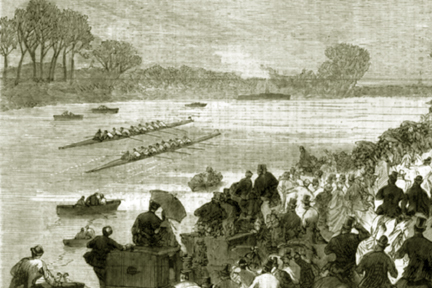 The 1829 Oxford-Cambridge boat race represents a milestone in the history books. Considered the first athletic competition between two universities, it establishes rowing as the oldest Intercollegiate sport in the World. Since that infamous race, millions more have plied hands to oars and endeavored mightily with pure blood, sweat and tears. This material is the common bond between all rowers, past, present and future. It forms the foundation upon which every boathouse now stands, and this common fiber is what promises to keep the spirit of the race beating for generations to come.